Likely the first real ambidextrous leather sheath with perfect fit. 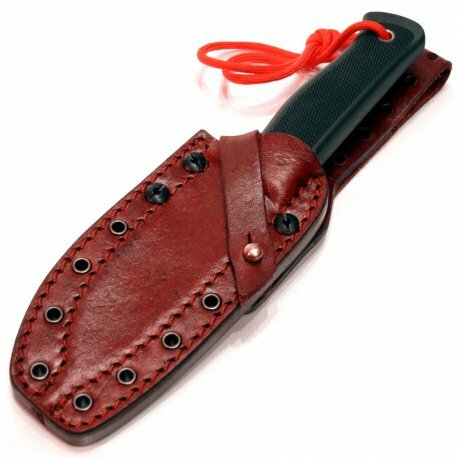 Premium leather sheath in 3 mm full grain leather for Knife Knv2, Mil & VG-10. Created in a completely test-based development process. Leather Sheath Knv2 is packed with functional unique features. The unique Flexi-fit system provides uniqe flexibility and allows you to carry your Knv knife exactly as you want. The belt loop can even be adjusted to accommodate waist belt when carrying backpack. All the proprietary features that made the Knv Kydex sheaths renowned. These leather sheaths even have drain hole for faster drying. The leather's very high quality and fat content allows you to wet-form your Knv2 leather sheath for a completely unique precision fit.